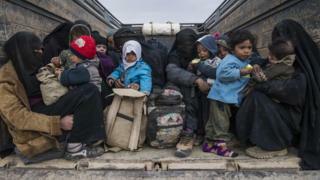 The battle to claim the last pocket of territory from the Islamic State group (IS) is being held up because thousands of civilians remain trapped there. US-backed Kurdish forces launched an assault on Baghuz, on the Syrian side of the Iraqi border, last week. US President Donald Trump said on Friday the defeat of IS would be announced "over the next 24 hours". But those 24 hours passed on Saturday with no announcement from the White House on the defeat of IS. Instead, Kurdish fighters said the news was likely to emerge "in the coming few days" as civilians continued to flee. 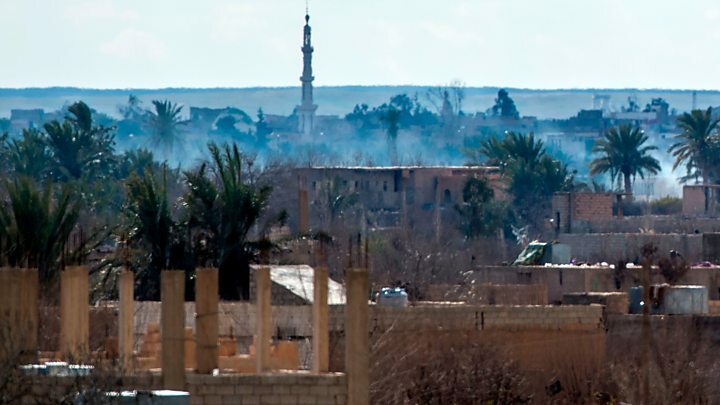 Jiya Furat, the leader of the battle for Baghuz for the Syrian Democratic Forces (SDF), said IS fighters were now trapped in a section of the town that was 700 metres long and wide. "Thousands of civilians are still trapped there as human shields," he said on Saturday. "In the coming few days, in a very short time, we will spread the good tidings to the world of the military end of Daesh [IS]." SDF spokesman Adnan Afrin told Agence France-Presse they were surprised to learn how many civilians were still inside. The SDF had to slow its approach as a result, he said. The UK-based Syrian Observatory for Human Rights reported that 440 IS fighters had surrendered over the past few days, but the SDF believes a few hundred remain trapped in Baghuz. The Observatory said efforts were under way to find IS fighters hiding in tunnels they had dug around Baghuz. What did Mr Trump announce? Four years ago IS controlled 88,000 sq km (34,000 sq miles) of territory stretching from western Syria to eastern Iraq, proclaimed the creation of a "caliphate", imposed its brutal rule on almost eight million people and generated billions of dollars from oil, extortion, robbery and kidnapping. But in December, Mr Trump surprisingly announced the withdrawal of US troops from Syria as he believed IS had been "beaten". Then on Friday afternoon, he said: "We have a lot of great announcements having to do with Syria and our success with the eradication of the caliphate and that will be announced over the next 24 hours."